The Brown Gardenia is usually a small tree, with smooth, longish rounded-end leaves that have oil dots that can be seen with a lens (Cooper and Cooper 1994). The flowers are fragrant and with overlapping white petals. These flowers appear in spring, and are the followed by the fruits which appear for a long period over winter. 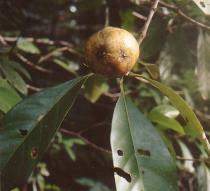 These fruits are large, round and smooth and ripen slowly from brownish to yellowish. The flesh is quite thick and hard, and there are many seeds set in a pulp inside. This pulp is slightly edible, but tastes quite terrible. Brown Gardenia is found in rainforest, usually near water, and on the edge of mangroves, along the tropical eastern Queensland coast.